This year like any other I have reviewed for this site is no different in that it has been completely different to the previous year. Unprecedented high temperatures during March, the wettest April on record and apart from one blinding week in May (the one in which I got married) it has continued raining, accompanied by wild winds, interspersed by some rays from the sun. 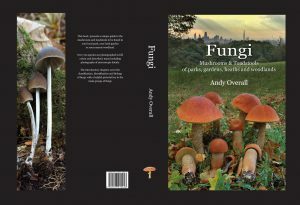 So why am I banging on about the weather when this is a site dedicated to fungi, I hear you ask, well all this ‘weather’ will have and has had an impact upon what kind of fungi we are likely to see over the coming months. One of the first species that I often see at the beginning of the year around January time, given that everything is not frozen, is that of Pleurotus ostreatus, The Oyster Mushroom. This year was no exception with plentiful fruiting’s in many of the spots where I knew it to be present. And then March arrived, a month of normally wet windy conditions was masquerading as high summer with temperatures in the high 20’s. As we moved into Spring things really became quite interesting, with the incescent rain and lower temperatures during April, a number of species occurred a little out of sink, such as that of the Blewitts, both Field and Wood. Common thought is that some of these saprobic fungi were triggered into fruiting by the high temperatures followed by the low therefore mimicking a kind of short summer moving into autumn type scenario. The typical spring species did very well, such as St George’s, which really did put on a show in all of the spots I’m aware of and more. Chicken Of The Woods, Laetiporus sulphureus had me thinking that it enjoyed the hot dry weather but this year it proved me wrong whilst fruiting profusely during below average temperatures during May. A really nice record was that of Agaricus phaeolepidotus, one of the Yellow Stainers, although this is more of a Lesser Yellow Stainer as it doesn’t stain as brightly as the Yellow Stainer itself. This was found by Keir Mottram and his good lady Jen whilst on a leisurely stroll around Bocking Cemetery in Essex, before attending my wedding to my good lady Heather at St Mary’s Church, just around the corner. This is an uncommon species, which is now thought be more widespread in Southern England than originally believed. Summer arrived with a bang but with totally unrecognisable low temperatures, lashing rain and high winds. During all this weather a big surprise was discovering Tricholomella constricta in my very own back garden. I had made a collection of this species ( the 1st for Middlesex) during my survey of Holland Park last year, which beggers the question, did I carry spores for this into my own garden?? I didn’t introduce the 2011 collection into the garden at all, for the taking of pictures etc etc. The situation within which this has fruited I had only a few months previously, dug up soil and placed shingle from the side of the house into a hole within which went some Rosemary. Were the spores within the shingle or on the roots of the Rosemary? Or was it the disturbed soil that had the spores germinate, produce mycelium and send up fruit bodies?? All very intrigiung I must say. An update on that, I have just read that Tricholomella constricta can occur in areas where urine has/is deposited, an aemonia lover no doubt. Now, we have Sophie, the Tri Red, Aussie Shepherd Dog that has been with us about year now, could she be the responsible for the appearance of this fairly rare fungus in the garden???? The fungi have been providing meals to an army of slugs, just as soon as something breaks the surface, it is set upon by a slimy mass and by the time I get to it there’s nothing left but a mere shell. We need a break, some warmth, not least for our bones and the poor flooded folk of the North and West. I’ve still been recording plenty of things, Russula’s are well on the move, R. puellaris, R. ionochlora, R. parazurea, R, heterophylla, R, pseudointegra and R. cicatrictata have all been up and about during the last weeks of June into mid July. And a new species for the Kenwood Estate, Russula puellulla a small, yellowing species, fruiting close to Hornbeam, Oak & Beech. Not too many Boletus to report though, B. luridiformis, X. porosporus and a couple of Brown and Orange Birch Boletes is the best I can offer at this point. They love and really do need some of the hot summer days that we are missing right now. I fear that we if don’t get a decent spell of sun we may see a poor showing of Boletus this summer but that is not to say that it won’t come later in the year, here’s to a blinding August or September!! Inocybe species have been around, I. perlata and I. asterospora both in nice healthy numbers. And what a year so far for Agaricus, I’ve known for some time now that this genus LOVES wet periods. What last summer was for Amanita fulva and allies is to Agaricus this year. One spot I pass every morning whilst walking the dog has been producing Horse Mushrooms for the past 2 months!! But I’m a little tired of all the wet now and need some heat, so come on summer WAKE UP!!!!! The rain abated and the soil dried over the following month to 6 weeks and there wasn’t a mushroom to be seen………………..
As ever my site at Puttenham Common came up trumps at the end of August, whilst everywhere else seemed to be struggling to produce anything more than the odd Earthball. This first visit to Puttenham in fact produced one species new to Britain, Cortinarius azureus and a species of Tricholoma that has caused some debate, possibly, simply, T. virgatum or less simply T. sciodellum, a rare Birch associate described by Peter Orton in the 1980’s. Also recorded from this and the following visit to Puttenham was the rare Russula aquosa a close relative of R. fragilis, having the same, nasty, acrid taste, associating with Betula often among Polytrichum moss, which this was. As well as these there were a plethora of other Russula’s, especially R. ochroleuca and R. claroflava and the less common R. aeruginea. Also evident, as it is every year, is the best display of Lactarius helvus that one is ever likely to see. Out of all of the sites that I have visited across the UK, nowhere has produced a display like this, in fact I very rarely see L. helvus anywhere else, the odd one at Wimbledon Common maybe. There have been occasions, when L. helvus has been in full swing, that the area reeks of a curry-like smell, and we are talking about a fairly remote location, not an area with a local curry house nearby, wonderful! Closer to home, on Hampstead Heath, putting the Kenwood Estate aside, produced a few interesting species. Agaricus species have been good, A. arvensis, A. osecanus, A, macrocarpus, A. langei, A. silvaticus, A. impudicus, A. xanthodermus and A. augustus were all recorded at some point between May and Nov, some for the whole duration, fruiting on and off. My site for nice species of Amanita produced A. pantherina, A. gemmata and A. phalloides, no A. franchetii this year though, probably missed it. By far the best Boletus record from the Heath was that of B. queletii found on a joint trip with the LNHS during August. A new record for the Heath and for Middlesex. No repeat fruiting of Buchwaldoboletus lignicola. Not that others haven’t but this has been a rather interesting year for me, a year in which I was commissioned by The Historic Royal Palaces to carry out a survey of the larger fungi (with an emphasis on grassland species) of Home Park, part of the Hampton Court Palace complex. Home Park has turned out to be a rather rewarding site, with some excellent records, with species I have not encountered before such as Hohenbuehelia atrocaerulea and some that I rarely do such as Cortinarius trivialis. The site, around 188 hectares is home to some 300 fallow deer and plenty of rabbits both of which readily graze particular areas of the grassland. These grazed areas have provided some good records of otherwise uncommon species, Lepiota oreadiformis was here in large numbers, resplendent in a rich fawn brown colouration. Healthy populations of the rather uncommon Leucopaxillus giganteus were to be found in many areas of the unimproved acid grassland at the western end of the site and on old unimproved amenity grassland where a good population of Agaricus urinascens was also recorded. It was a site that I really looked forward to visiting as I expected something unusual each time. The New Forest was a disappointment this year with very little to shout about, once again, the relatively low temperatures combined with the sheer volume of water that fell from the sky was just not conjusive with many mycorrhizal fungi such as Boletus and Russulla, however Cortinarius and Inocybe seemed not to be having such a problem as a number of species were picked up during both visits. As one would expect during such weather conditions wood rotting and other saprobic fungi prospered. In all, 2012 was a rather flat year, especially for mycorrhizal fungi and especially for those genera that like a little more heat, such as Boletus, Russula and Lactarius, among others. The unprecedented volumes of water in combination with relatively low temperatures did not work for many of these fungi. However, as always with the larger fungi, where there are losses there are gains and it was the saprobic fungi that won out during 2012, Agaricus had a fantastic year, as did Melanoleuca, Mycena, Gymnopus, Macrotyphula, (M. fistulosa, a 1st at Kenwood) Hygrocybe etc etc. oh and the first record of Verpa conica since 1970’s from Hampstead Heath. Wood rotting fungi had a field day. Some mycorrhizal genera didn’t seem to mind the deluge and low temperatures, Inocybe, Cortinarius and Hebeloma being among them. One thing I can be certain of, 2013 will be different again…………………………………………………………………………..See you all out there!